For eight years at the West County Detention Center in Richmond, Calif., monthly vigils were organized by faith communities and immigrant rights organizations to support those inside. 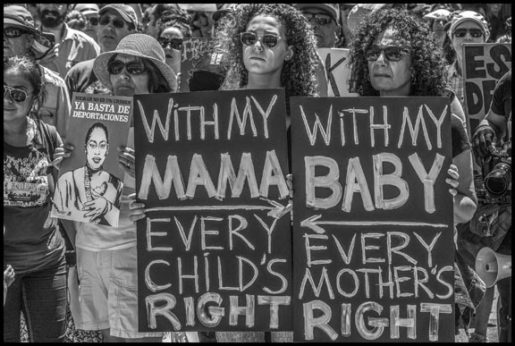 These protests and the testimony of detainees’ families were so powerful that the county sheriff in July announced he was canceling the contract he signed long ago with the federal government to house the prisoners. 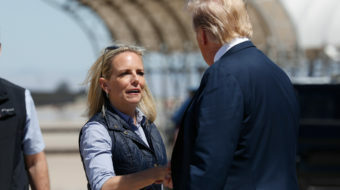 While that was a victory, it did not lead to freedom for most of them, however, who were transferred to other detention centers. Instead, it has forced us to examine deeper questions. 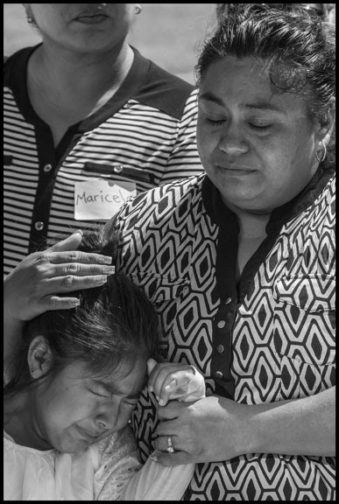 In those vigils, we heard the living experiences of people who have had no alternative to leaving their homes and countries to escape violence, war, and poverty, who now find themselves imprisoned in the detention center. We have to ask, who is responsible? Where did the violence and poverty come from that forced people to leave home, to cross the border with Mexico, and then to be picked up and incarcerated here? Whatever the immediate circumstances, there is one main cause for the misery that has led migrants to the United States: the actions of the government of this country, and the wealthy elites that the government has defended. I went to Guatemala several times over the last two decades with my friend Sergio Sosa. Sergio was brought up in the church. As a young man, he was on his way to becoming a priest. Then he became a combatiente (a participant in the social struggle and war in Guatemala from the late ’70s to the early ’90s), but he remained a friend of Bishop Bobadilla in Huehuetenango, a disciple of Archbishop Romero in El Salvador (who was assassinated at the beginning of El Salvador’s insurrection and war of the same period). One evening Bobadilla, Sergio, and I spent a long time talking with about the civil war of the 1980s, and the fact that the massacres of tens of thousands of indigenous inhabitants of the mountains above Huehuetenango were carried out with guns that came from the United States, by soldiers whose officers had gone to the School of the Americas in Georgia. Yet in all the talk I felt no anger from the bishop toward me as someone from the United States. “Why not?” I asked. “Because we know you have as little control over your government as we do over ours, probably less,” Bishop Bobadilla answered. “But you’re interested in us. You want to hear about what happened, you know it was wrong, and you want to take some responsibility for it.” Today when I read about the women and children from Guatemala in detention, when we hear their voices and see their photographs, I think about what Bobadilla said. It sounds so unbelievably hopeful–this idea that as people here in this country we want to take responsibility, and recognize the history of all that’s happened between us and the people of Central America. How did these children come to be here? And what does taking responsibility mean? It’s not enough to believe that all children should be valued and cared for with the greatest tenderness and love. We need to know why they’re here, in such an obviously dangerous and painful situation, enduring separation from their families and the adults in their lives. You don’t hear much discussion of responsibility or acknowledgment of history in the discourse of our national leaders. And it’s not just the racist slurs of Trump. This means we have had separated families for at least 35 years. When families settled in U.S. cities, many lived in the MacArthur Park neighborhood in downtown Los Angeles. In the 1990s this neighborhood was the focus of the Ramparts scandal, which exposed massive corruption in the Community Resources Against Street Hoodlums (or C*R*A*S*H) anti-gang unit of the Los Angeles Police Department. In the name of combating gang activity among young immigrants from Central America, cops dished out unprovoked shootings and beatings, planted false evidence, framed suspects, stole and dealt narcotics themselves, robbed banks, lied in court, and covered up evidence of their crimes. It was one of the most extensive cases of police misconduct in U.S. history. The young people they targeted were imprisoned and then deported. The names of their gangs in Central America refer to Los Angeles streets. Some 129,726 people convicted of crimes were deported to Central America from 2000 to 2010. With the deportations, the two most prominent Los Angeles gangs-the Mara Salvatrucha 13 and the Barrio 18-quickly became the two largest transnational gangs. In El Salvador, Guatemala, and Honduras, U.S. law enforcement assistance pressured local police to adopt a mano dura or hardline approach to gang members. Many young people deported from the United States were incarcerated almost as soon as they arrived. Prisons became schools for gang recruitment. U.S. funding for law enforcement and the military still flows, two decades after the wars ended, through the Central America Regional Security Initiative. Marine Corps General John Kelly, when he was commander of the U.S. Southern Command, said that migration was a national security threat, calling it a “crime-terror convergence.” Today he’s Trump’s chief of staff in the White House. During and after the war, the United States imposed an economic model on Central American countries based on producing for export, in “export processing zones” where companies could operate without complying with normal taxes, environmental regulations, and labor standards. San Pedro Sula in Honduras, called a “murder capital” by the New York Times, is not just a city of gangs. It’s a factory town. One of San Pedro Sula’s working women, Claudia Molina, described the conditions there: “Our workday is from 7:30 AM to 8:30 PM,” Molina told me, “sometimes until 10:30, from Monday to Friday. On Saturday we start at 7:30 AM. We get an hour for lunch and work until 6:30 PM. We take a half hour again to eat, and then we work from 7 PM until midnight. We take another half hour rest and then go until 6 on Sunday morning. Working like this I earned 270 lempiras per week [about $30 at the time].” When Molina and her coworkers tried to organize a union, 600 women were fired. Over 95 percent of the women in the Honduran plants are younger than 30 and half younger than 20. To keep women from getting pregnant and leaving the factory to have children, USAID funded contraceptive distribution posts staffed by nurses in EPZ factories, including Osh Kosh B’Gosh. You can make the clothes for U.S. babies, but don’t have any of your own. And kids themselves are workers. Girls between 10 and 14 make up 16 percent of the women in the factories. The U.S. government promoted policies providing low-cost labor to U.S. corporations, promoting economic development that tied the economies of Central American countries to U.S. corporate investment. By the end of the 1990s, the number of Salvadorans in the United States had reached two million. And U.S. taxes didn’t just pay for war and maquiladoras; they funded an even larger strategy of encouraging foreign investment through privatizing state utilities, services, and assets, and of negotiating “free-trade” agreements with Mexico (the North American Free Trade Agreement-NAFTA) and with Central American countries (the Central American Free Trade Agreement-CAFTA). The United States used immigration as a lever to force governments to go along. 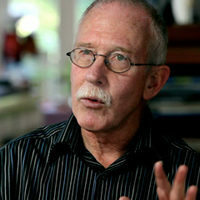 In 2004 Deputy Secretary of State for Latin America Otto Reich threatened to cut remittances if people voted for the left-wing Farabundo Martí National Liberation Front (FMLN) in El Salvador. After the FMLN lost, CAFTA was signed and implemented in 2005 by the government that Reich supported. In Honduras, the Congress had to ratify CAFTA in a secret meeting at midnight, when no opposition parties were present. Then, in 2009 a tiny wealthy elite overthrew Honduran President Manuel Zelaya because he raised the country’s minimum wage, gave subsidies to small farmers, cut interest rates, and instituted free education. Raising living standards would have given people a future at home. Nevertheless, after a weak protest, the Obama administration gave de facto approval to the coup regime that followed. If social and political change had taken place in Honduras, we would see far fewer Hondurans trying to come to the United States. Many of the children and families coming from Central America to the United States today are therefore coming to reunite with their families, who were divided by war and earlier migration. They are responding to the threat of violence caused by criminalization and deportations. They are looking for economic survival in countries tied to the neoliberal economic model. These are the real causes. There is no lax enforcement, and the claim that kids are coming because they think they’ll be allowed to stay is a myth. Around 400,000 people are still deported every year, and 350,000 people spend some time in an immigrant detention center. The Border Patrol has 20,000 agents, and the United States spends more on immigration enforcement than the FBI and DEA budgets combined. But children will keep coming so long as we don’t take responsibility for dealing with causes of migration. Knowing where the violence and poverty are coming from, and who benefits from this system, is one step toward ending it. But we also have to know what we want in its place. What is our alternative to the detention centers, and the imprisonment of the people inside? To the hundreds of people who still die on the border every year? An end to mass detention and deportations, and the closing of the detention centers. An end to the militarization of the border. An end to the idea that working without papers should be a crime. An end to the trade agreements and economic reforms that force people into poverty and make migration the only means to survive. An end to military intervention, to military aid to right-wing governments, and to U.S. support for the repression of the movements fighting for change. The migration of Central Americans has benefited our labor and social justice movements. 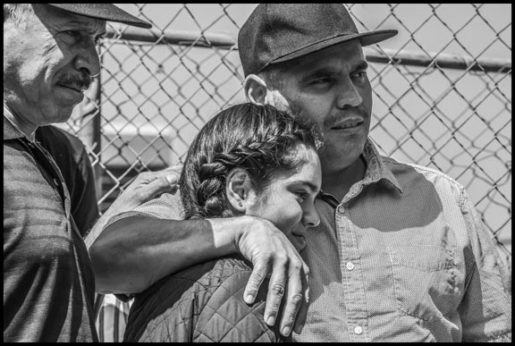 One big example was Justice for Janitors in Los Angeles, where Central American janitors defied the police and were beaten up in Century City, but finally won a contract. It is a powerful combination-workers on the bottom with not much to lose in minimum wage jobs, and politically sophisticated organizers hardened in a war zone. That should inspire progressive movements in the United States to look at immigration in a different way. Simply being an immigrant may not bend a person politically to the left. 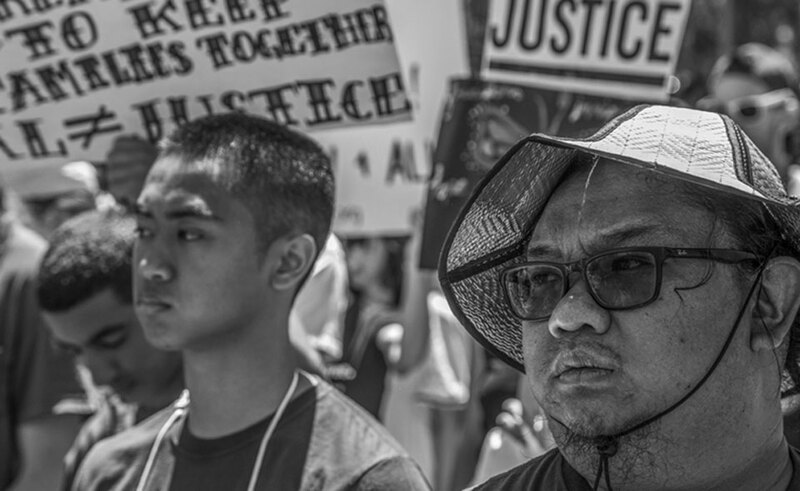 But many immigrants bring organizing skills and working-class political consciousness with them, depending on where they come from, and their previous experiences. That right can’t be achieved in Central America alone. The policies pursued by our government, whether through war and military aid, or through trade agreements and pressure to keep wages low, all produce migration. When we look at the families in detention centers today, we have the responsibility to give them a world in which the choice to leave Guatemala or El Salvador or Honduras is truly voluntary-where they have a future with dignity if they choose to stay. The ability to stay home is as important as the ability and right to migrate. If you think this is just a dream, remember that a decade after Emmett Till was lynched in Mississippi, the U.S. Congress passed the Civil Rights Act. That same year, 1965, Congress put the family preference immigration system into law, the only pro-immigrant legislation we’ve had for a hundred years. That was no gift. A civil rights movement made Congress pass that law. When that law was passed we had no private immigrant detention centers. There were no walls on our border with Mexico, and no one died crossing it, like the hundreds who now perish in the desert every year. There is nothing permanent or unchangeable about these institutions of oppression. We have changed our world before, and our movements here can do that again.